With subtle color harmonies, sculptural furniture, worldly art collections — and a dash of wit and free spirit — Ben Dhong offers new and lively ways of thinking about design and décor. 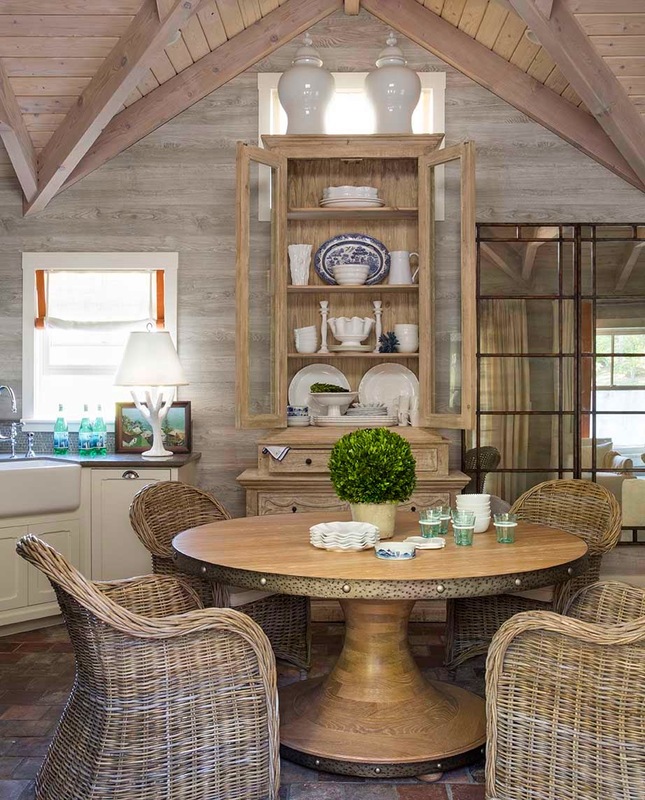 Look for subtle tonalities, inspiration, and ideas in every room. 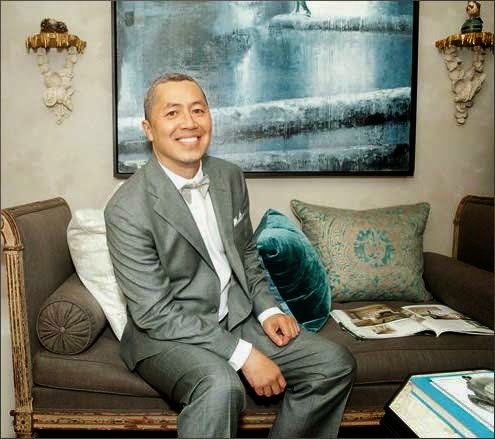 I recently sat down for a chat with Benjamin Dhong about a new residence he recently completed in Woodside, the leafy and ultra-private Silicon Valley town just south of San Francisco. His client is the CEO of a global Fortune 100 company. The Japanese family has two children. The shingled house was built in the 1930s, a golden age of domestic residences in America. It is surrounded by gardens with white roses and hydrangea. “The family wanted a house that both reflected them but also was suitable for important business gatherings,” said Ben, who started his design company ten years ago, after working closely with Martha Angus. “I knew I wanted natural materials, and a sense that everything hadn't been a purchased on the same day. I thought of bringing in the garden tonalities inside the house. Especially, I wanted to look as if it had come together over decades, with a mixture of high-low, or as Andrée Putman used to say, a combination of “rich” and ‘humble”. The goal in the living room was to create a calm, cloudlike feeling using textures and light to set the mood. 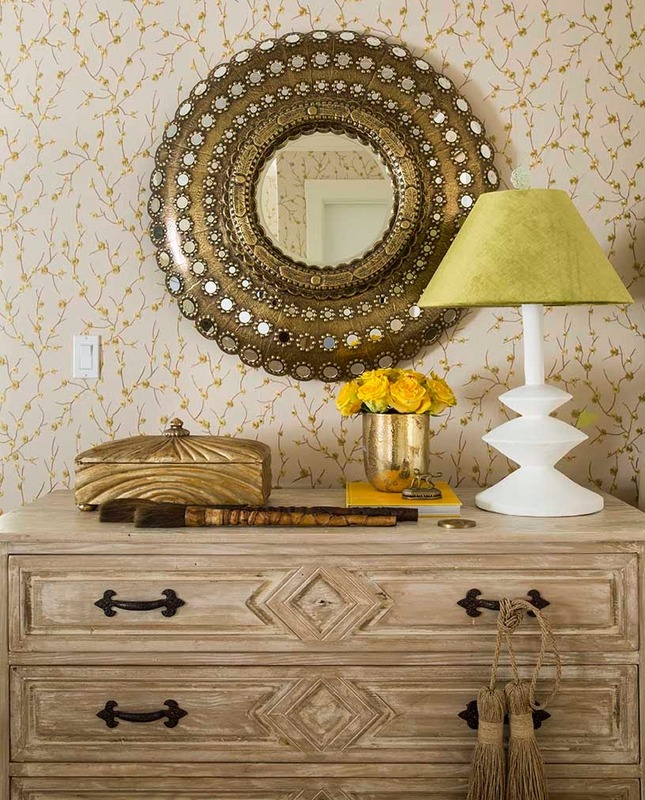 Natural materials like grasscloth, jute, are juxtaposed with the dazzle of gold. Hints of brass add low-key 'gilding'. 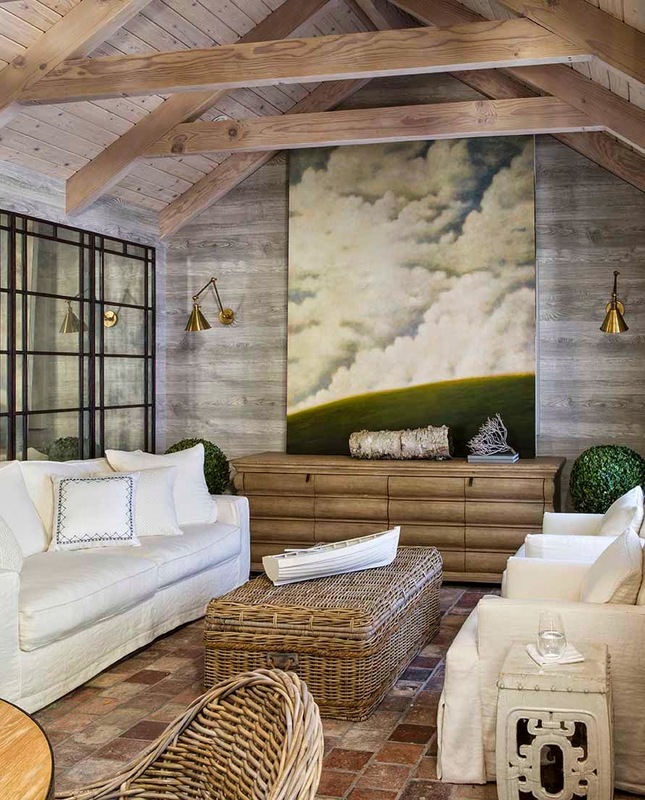 "To make large rooms feel more cozy I believe that all the corners of a room should be designed for use,” said Dhong. “This makes a more welcoming space. I created five zones (main fireplace seating, game table, corner banquette, writing desk, reading area). 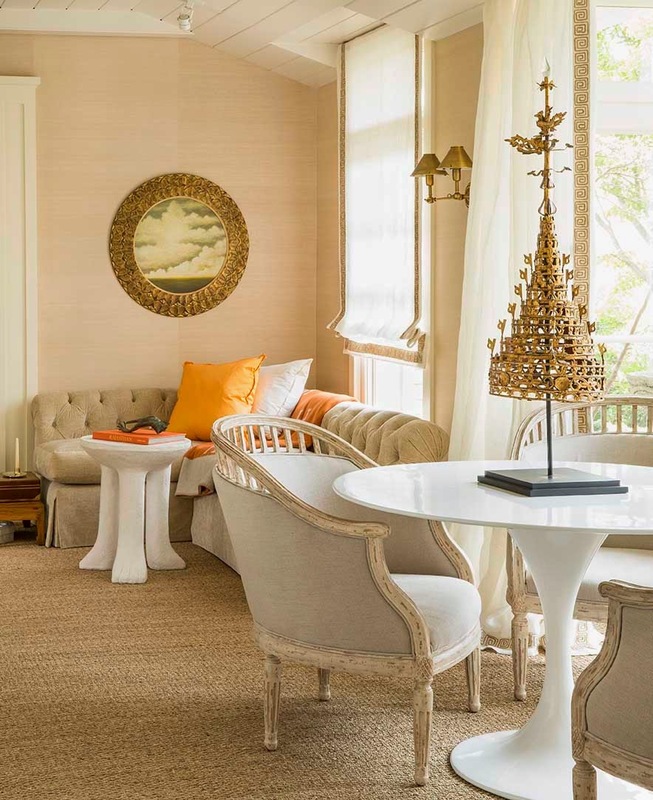 “Designing in neutrals requires layers of texture so we applied grasscloth to the walls, added seagrass to the floors, and kept all the upholstered fabrics to a linen palate,” said Dhong. A large Saarinen table anchors the bay window. It’s a clean-lined juxtaposition to the French tub chairs and the temple spire. 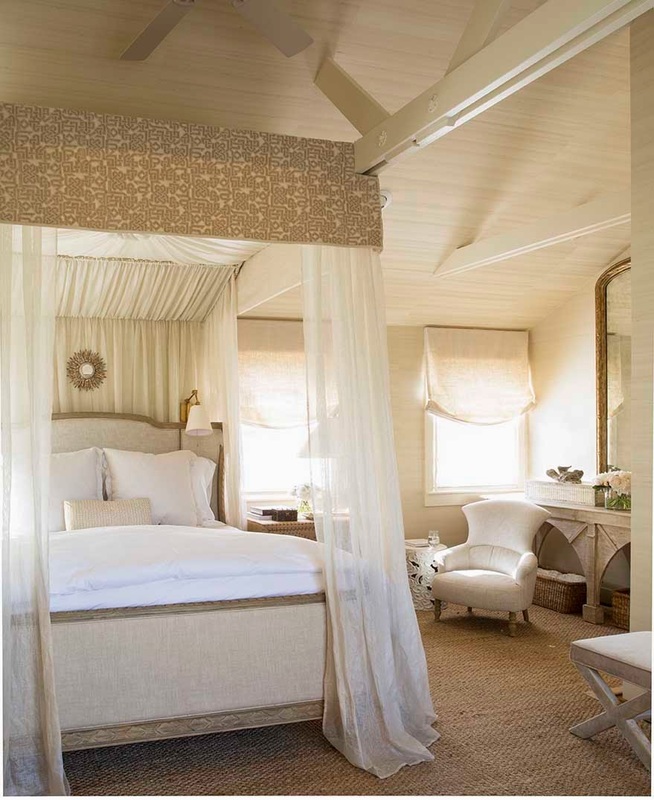 He designed airy linen sheers bound with earthy jute Greek key to filter the light. “I like mixing periods as long as they all balance,” said Dhong. In the living room he brought in Gustavian, French, Swedish Deco, mid-century, John Dickinson, Asian fragments, Italian sculpture, modern art. “We commissioned a pair of hand-carved wooden tree of life consoles from Myra Hoefer Design, Healdsburg, and had them gilded,” he said. Simple metal mirrors from Restoration Hardware keeps the look restrained. The daybed is by Carl Malmsten, Sweden’s twentieth-century answer to Ruhlmann. He placed a daybed in order to keep the room more open. An 18th-Century Swedish desk is paired with a vintage wiggle chair. Its curves mimic the cloud altar fragment. “I'm especially pleased with how the Frank Gehry ‘wiggle’ chair dialogs with the Gustavian secretaire and the Italian cloud fragment. It’s a playful dance,” said Dhong. The glories of green are a favorite of Dhong’s, especially unexpected green tones. The house sits in almost an acre of old oaks, maples, cedar trees and a cloud of roses, hostas and hydrangeas. “I wanted the dining room to be totally romantic,” said Dhong. “I found this mossy green toile that had pastoral scenes of frolicking nobles and peasants. 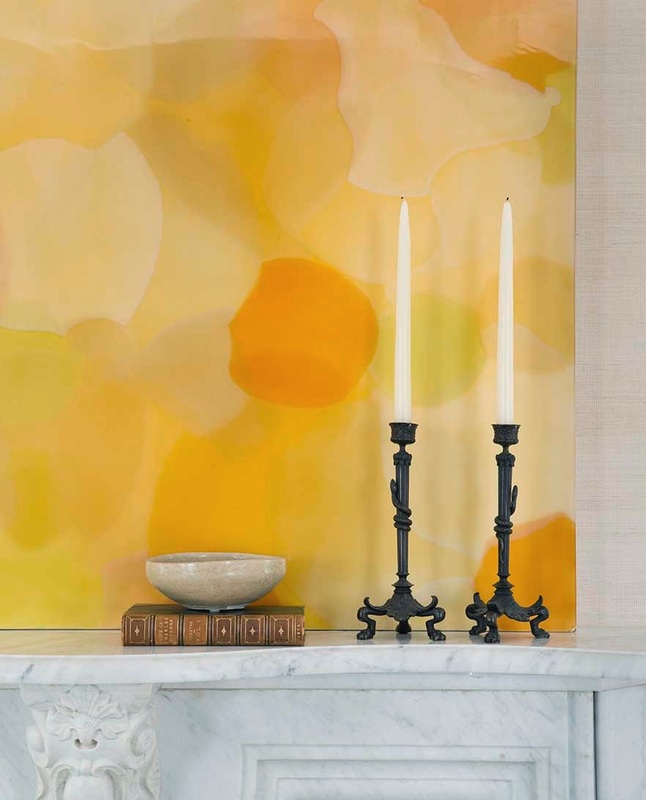 I balanced the traditional toile with bold strokes — an overscaled mirror, a modern Italian chandelier, a strong sculptural dining table.” Dhong designed the table with Candace Barnes Antiques in San Francisco. The modern light pendant is an unexpected combination with the toile. It's Italian from the 1950's. Each suspended lens captures the light and at night the fixture is ablaze with a fiery glow. The chairs are 18th-century from Lyon, France. “The chairs are fabulously crusty with pale green and parcel gilding, and perfect for adding faded glory,” said Dhong. He upholstered the seat in faded green leather for durability but topped it with green velvet. 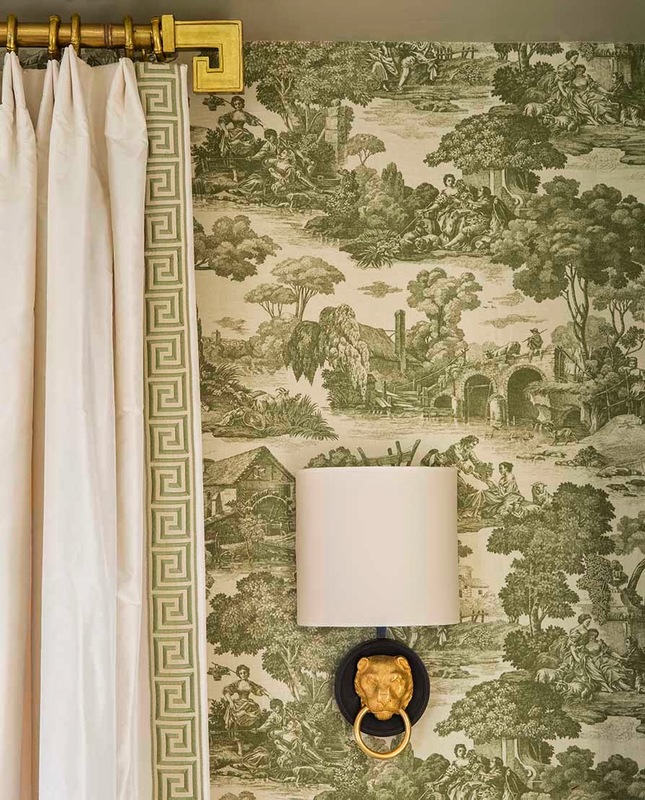 The curtain rod is a gilded faux bamboo with an overscaled key finial, a nod to the family’s background. “We decided to make both the dining room and library green to tie them together,” said Dhong. He backed the silk curtain with burlap to give it more body and to show a contrast rough texture, and an example of rich-poor design. This library originally was a plain white box with an old green wooden mantel. He designed the green ottoman bench with Moorish arches. It's very architectural and stands out like an elegant temple. The room does not get a lot of light so he added more mirrors flanking the fireplace. Dhong upholstered the frames in green velvet to make them quieter and to recede into the architecture. A green ikat fabric on the ram’s head chairs gives a fresh update to a classic chair. A primitive-style side tables from Bliss keeps the room from being too precious. A 1970s desk was repainted a soft green and is a chic base for the Giacometti-style lamp from Sirmos. This room ‘before’ was one of the least welcoming rooms in the house — cold, cavernous, quirky window placement, with an odd niche that made no sense. “We took all of those elements and created an aerie or treehouse — but an elegant and romantic one,” said Dhong. 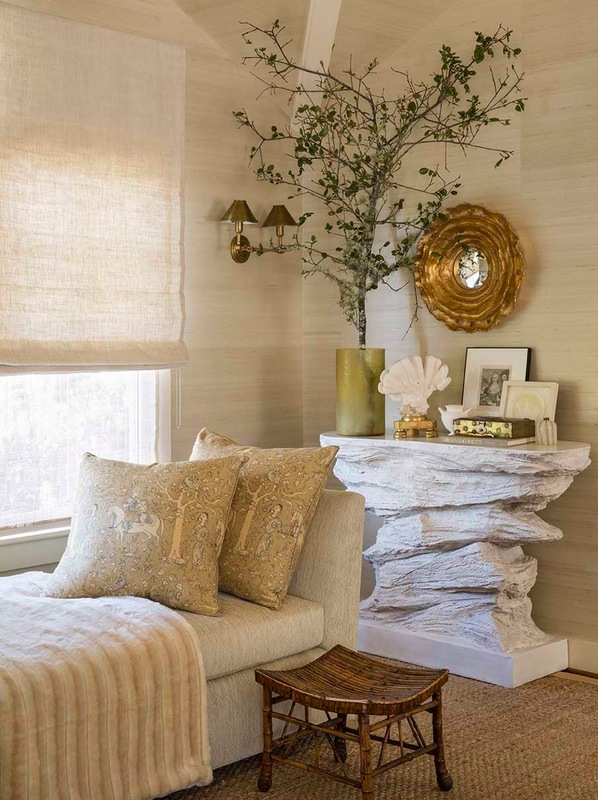 Layers of neutrals in varying textures give a sense of serenity and luxe to the room. He covered all the walls and sloped ceiling with a nubby silk wallpaper. 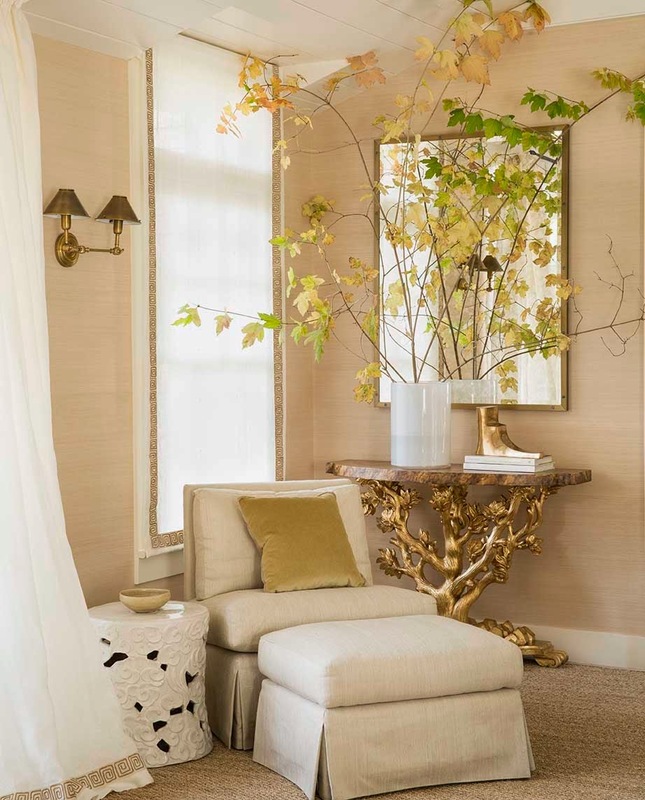 That gorgeous tall gold mirror is from Restoration Hardware Baby & Child. 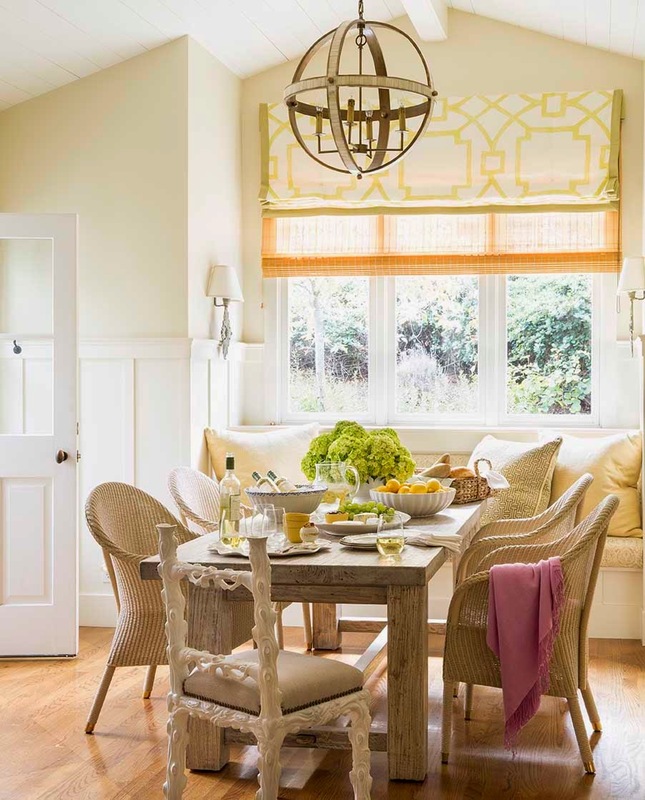 Painted wicker chairs from Janus et Cie provide a sculptural playfulness with the table and soften the edges. 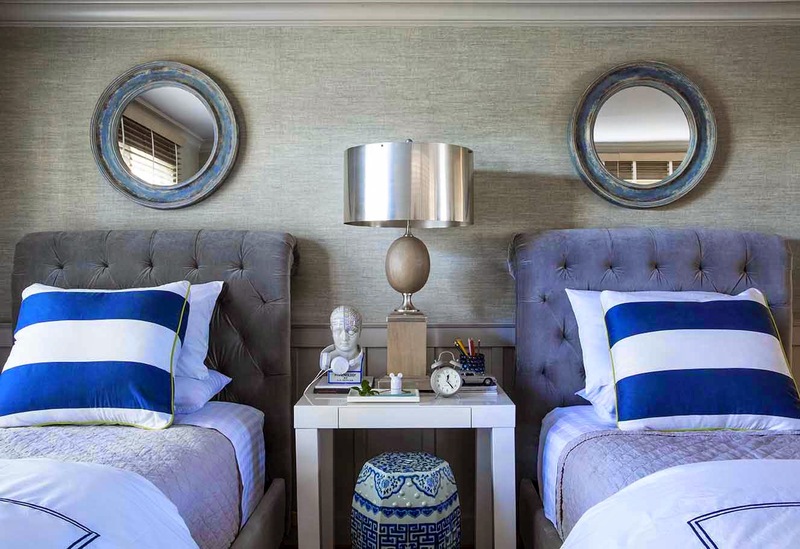 This room by Dhong is a modern ode to a classic boy’s room — with stripes and nautical themes. 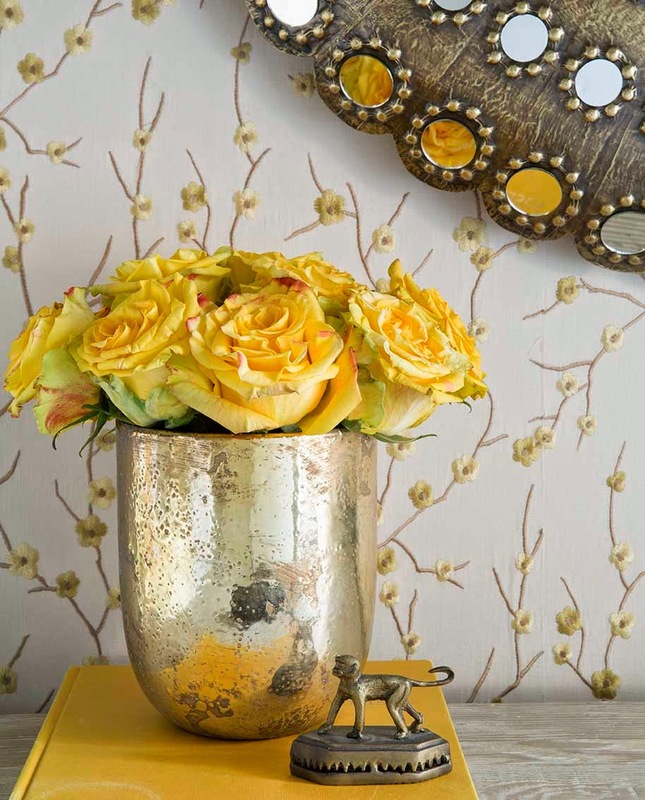 The wallcovering is cashmere from Rose Tarlow. He took blue and white mattress ticking, paper-backed it, and covered the ceiling with it. A pair of Chesterfield headboards takes on a more gentlemanly feel with grey velvet. A white lacquer West Elm desk provides a dash of white against all the grey/blue textures. He cloaked the walls in a mohair-like wallpaper from Rose Tarlow. “Everyone forgets the ceiling when selecting wallpaper,” noted Dhong. 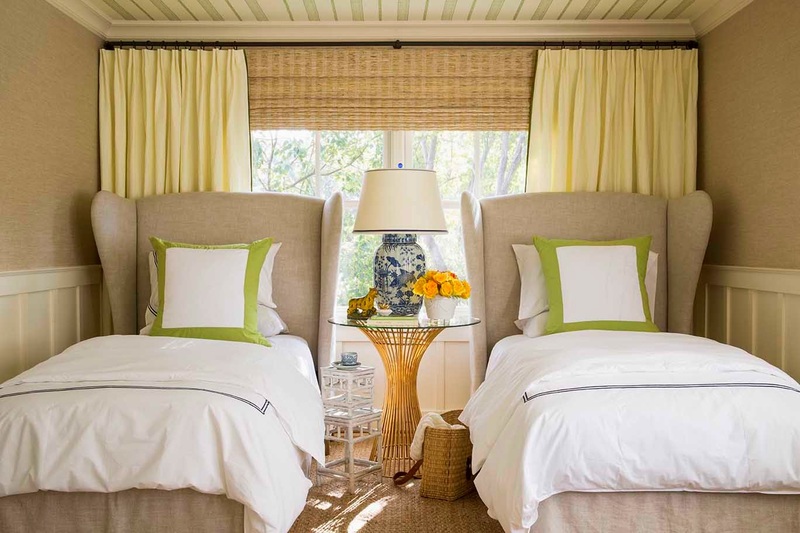 He chose a hand-blocked green striped linen from Carolina Irving to give the room a trip back into the past with it's almost ticking pattern. The hand blocking gives it an imperfect waviness. “This room was challenging for bed placements, so I selected a pair of headboards with exaggerated wings — the effect is to give each person their own little private compartment,” said Dhong. The bedroom is surrounded on three sides by the garden. 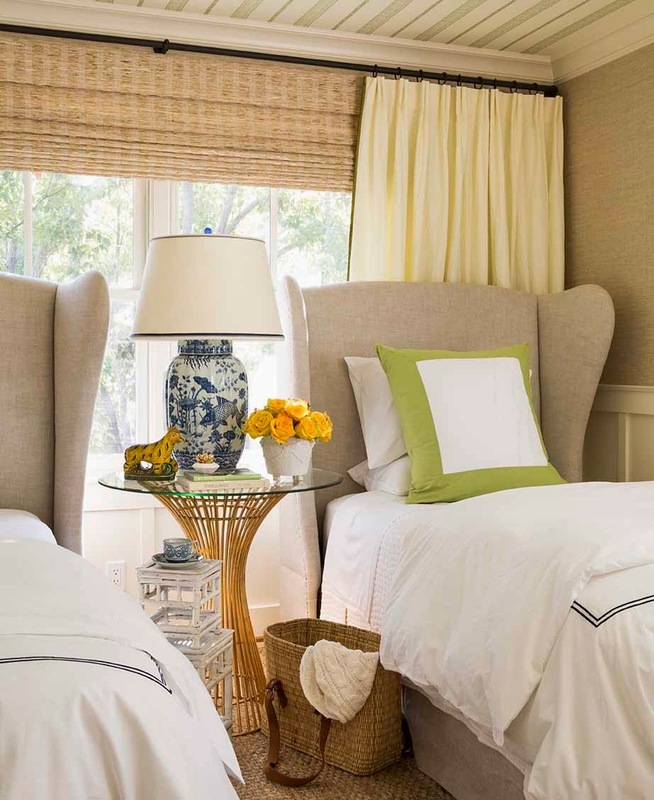 For the designer, it was a challenge as the only place to put the bed was adjacent to the bay window. “I designed a sleigh bed to make it feel more like a cozy nest,” said Dhong. He made a wallcovering from a fabric embroidered with branches. The room is a golden glow. 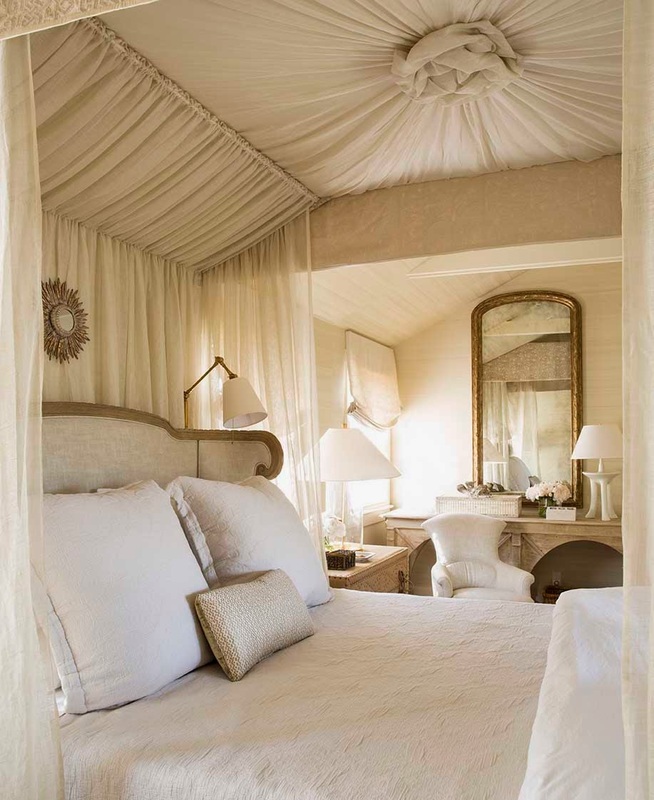 The guest bedroom room is an essay in layering textures to make things interesting and cozy. Fabric walls, linens, whitewashed wood, antique brass, white plaster, velvets, natural wovens, flash of gold offer contrast and harmony. Today the pool house looks as if it has great bones, but it was actually sad and forlorn. “When we found it with its plain white walls. It needed texture and character,” said Dhong. He covered the walls with his favorite faux-bois wallpaper from Nobilis. It gives instant character. 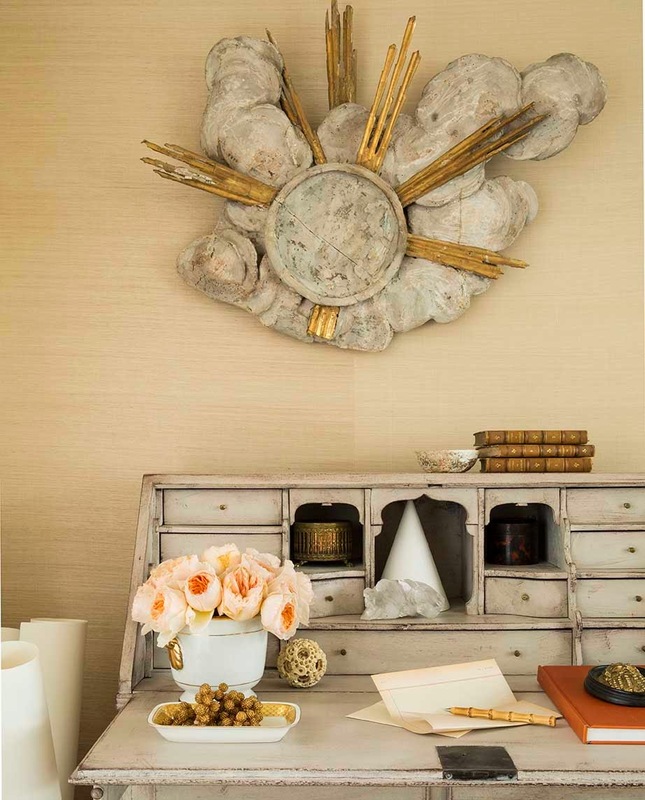 Photo shoot produced by Doretta Sperduto, Interiors Editor, House Beautiful. This photography first appeared in House Beautiful. Love this - great details! And it feels like it has a sense of humor. Wow Diane, what a stunning home. I am a major fan of Benjamin Dhong but this house knocks it out of the park. I think I understand what works in interiors, but then I see masterful spaces like this, so beautifully composed from disparate elements, and I am so deeply humbled and inspired! I have always loved fine, elegant spaces but Benjamin brings this organic warmth and yet crispness to them. I honestly don't know how he puts it all together. It's like a finely composed delicate masterpiece! Lovely post. I've pinned all the images for future study! Perfection. I totally agree. It's so rich with detail…and you are right that Ben has a great sense of humor and wit in design. I hope you are having a mild winter. I love your comments and your insight! 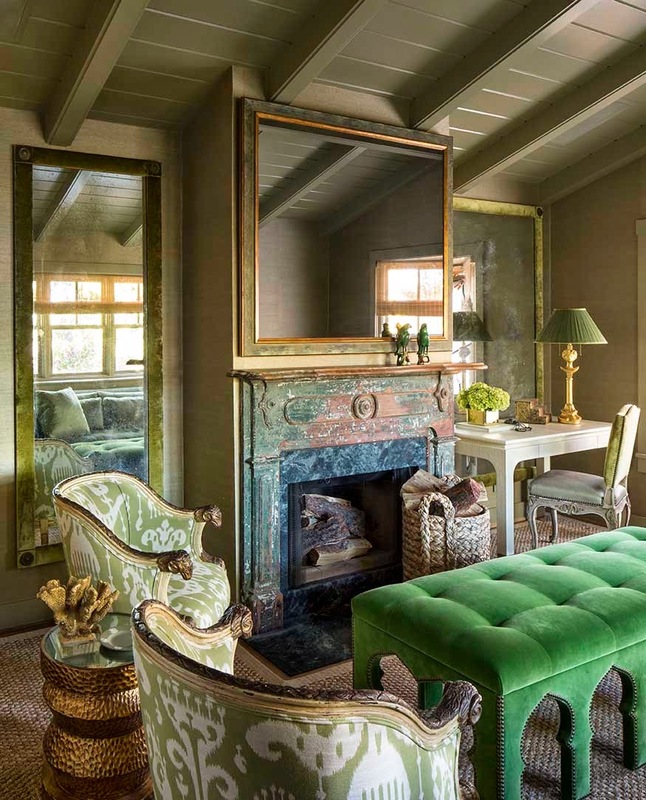 One of the reasons Ben's design is so enchanting (as you noted…) is that many of his ideas are very 'do-able'…such as the been tufted bench in front of the fireplace, of the old gold mirrors, or the wild-mild toile pattern of the green wallpaper. Note that he repeats some themes--gilding, railheads, natural fabrics, neutral tones with strong accents, and mixes of chairs. Any one of his ideas can me extrapolated…and used in any room, anywhere. I love his comment and idea of 'use all corners of a room'…which he does with a corner banquette, for example. The decor is endlessly interesting and full of detail. 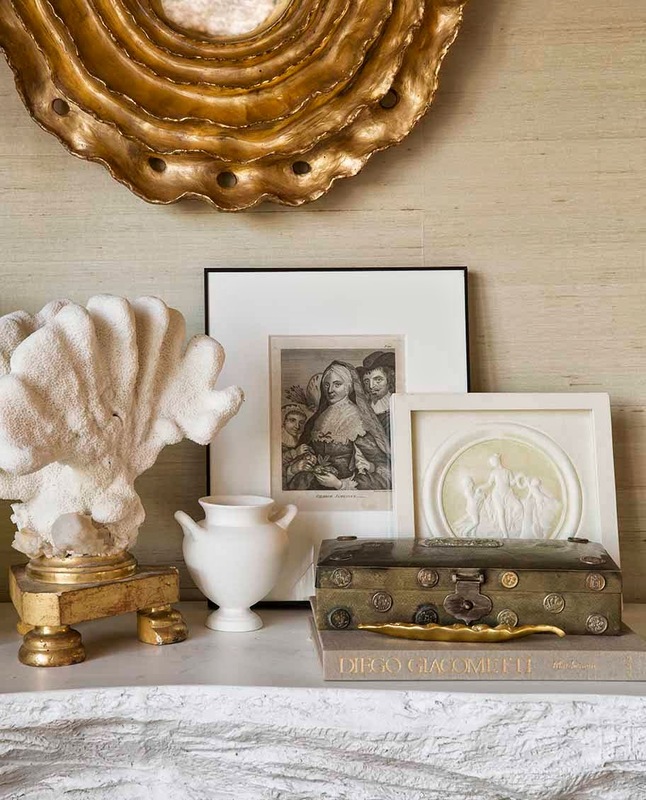 Ben is also a fantastic stylist--and some of his styling ideas (small brass objects, great lamps, white plaster, interesting pillows) can also be picked up and used for inspiration. Terri--as always a delight to hear from you. I'm so happy this gave you such delight. I'll tell Ben…he will be thrilled. Diane, you never disappoint! Nor does Benjamin! Uber chic!